Comments Off on Another record breaking weekend for Termoneeny! Tommy Hughes continued his recent record breaking achievements this weekend at the Larne Half Marathon, breaking the over 55 Irish Half Marathon record once again, with a superb run of 1:12:36! Congratulations to Michelle Comer who was first lady home last Wednesday at the 5K Fun Run in aid of Action Mental Health at the Ulster University Sports Centre Coleraine Michelle finished in a super time of 24:04! Congratulations to Raymond Keenan who took park in his first Parkrun on Saturday morning at MUSA in a super time of 22:49! It was a PB for Kevin McErlean on Saturday too. Kevin finished in 25:12 – well done Kevin! Also taking part in MUSA were sisters Maureen McGuckin and Karen Shaw, finishing in 26:39 and 29:07 respectively – fantastic running ladies! The PBs kept rolling in over the weekend with some fantastic running from Lindsay Gibson in Antrim, setting a new PB of 27:57 – congratulations Lindsay! Improving every week, well done. Congratulations also to Geraldine McGuckin who ran her first Parkrun today in an impressive time of 31:11 after returning from an ankle injury. Great to see you back out running again Geraldine. 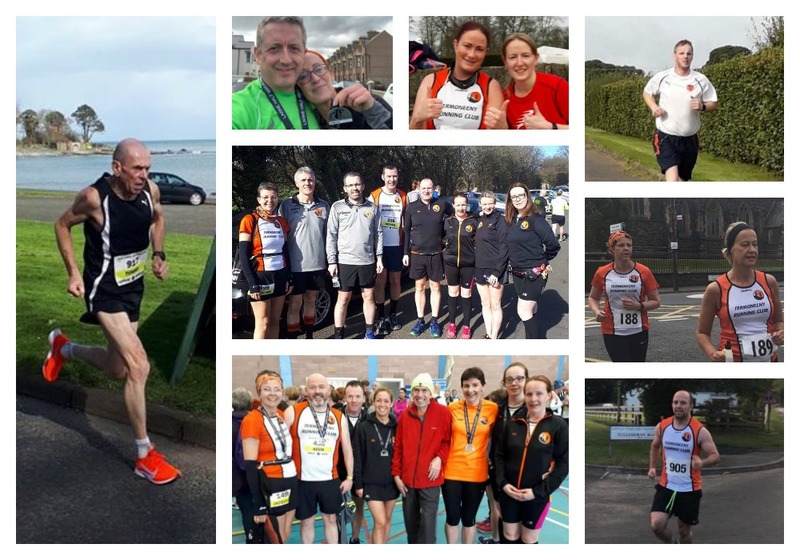 It was a successful day for Termoneeny Running Club on Saturday as 15 members made their way to the popular Larne Half Marathon. In near perfect weather conditions, there were several PBS and a podium no less for Tommy Hughes! Tommy was our first TRC runner home, first in his category MV55, broke the Irish Half Marathon record for his age category and placed 7th overall! Tommy ran a very strong race at this out and back 13.1 miler along the coastline from Larne to Ballygally and back, in a field of over 2000 runners. An incredible achievement from such a humble runner who is an inspiration to so many. New signing Niall Higgins made his debut for TRC and was our second male home with an impressive performance, crossing the finish line in 1:22:02 – congratulations Niall and a very warm welcome to Termoneeny Running Club. Our first lady home was Orla Hatt in just 1:41 which was a new PB for Orla at this distance. She was closely followed by Shauna Melaugh who finished very strong in 1:46:09. Well done ladies. There were top performances from everyone on the day at what was an enjoyable and extremely well executed event by Larne AC. Our thanks go to the club for their post-race hospitality and to the people of Larne who turned out in force to support the race so well. Full results are as follows: Tommy Hughes 1:12:36 7th overall 1st age category MV55, Niall Higgins 1:22:03, Stephen Pickering 1:31:22 PB, Kevin Darragh 1:38:29, Michael Burke 1:40:52, Orla Hatt 1:41:00 PB, Eamon Melaugh 1:41:10 PB, Damian O’Boyle 1:42:48 PB, Shauna Melaugh 1:46:09, Kerry Evans 1:48:30, Christina McErlean 1:56:02, Maeve Curley 2:14:06, Dara Curley 2:14:51, Tara Montgomery 2:22:21, Jacqueline McGonigle 2:43:26. Please note that the Termoneeny 5/10k 2019 will take place this year on the evening of Friday 10th May and registration is now open. Online entrants will be entered into a raffle to win a Garmin Forerunner 35! See our Facebook page and website for details. A six week 5k to 10 k programme will take place on Tuesdays and Thursdays beginning 2nd April, led by our ANI LIRF instructor Declan Leung. This is available to both member s and non-members. See the TRC Facebook for more details.